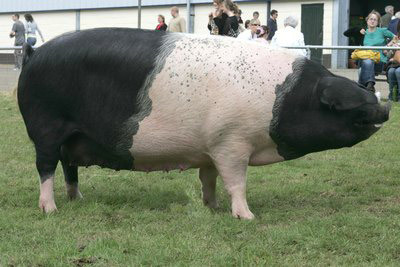 Hampshire pigs have erect ears and are black with a whitish band around the middle, covering the front legs. They are fourth most common breed of pig in the United States, and probably the oldest American breed of hogs. It is believed that Hampshire pigs come from the Old English Breed, found in northern England and Scotland. Most likely they were imported to America from Hampshire England between 1827 and 1839. Hampshire hogs are large, well-muscled, and rapid growers. They make good mothers and are good tempered.